Our NEUROGENX Team is proud to abundantly equip and enable providers to deliver a higher standard of care to patients suffering various balance issues, neuropathy and other chronic nerve conditions. At the heart of our partnership is a philosophy in which we invest fully in our providers as partners and hold ourselves accountable and pledge our commitment. A commitment to ensure our partners both clinical and business success. 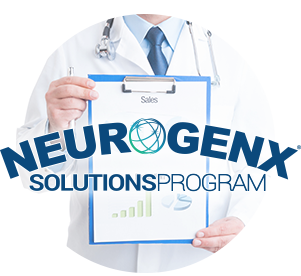 We have built our NEUROGENX Solutions Program on this: (1) Support & Service (2) Performance & Results (3) Model Training & Continuous Coaching to Ensure Clinical & Business Success within the first months, throughout the first year and years to come. We recognize conscientious and enterprising providers have different needs as well as different visions about practice growth. For these reasons, we have multiple steps and pathways for procuring and implementing NEUROGENX Clinical and Business Solution Assets to create a custom fit to suit every enterprising style and budget. We’re committed to work with you to customize a combination of technologies, training and support systems to attain your perfect fit!